The mobile electric warmwater heater EW 18 is compact and quickly usable as all components, such as pump, expansion tank, controls, etcetera, are integrated. A direct access to the heating elements and the uncomplicated as well as inexpensive replacement of all electric components make servicing and repair especially easy. On account of the direct connection with the pipe network (heating system) of the building, the EW 18 can be set up at every location and can be used within a very short time. 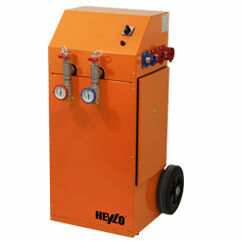 Heating boiler operation (20 to 80 deg. C), in case of boiler replacement, heating failure, for example.